The GROHE Blue CO2 bottles are available as starter kit and refill - consisting of four CO2 bottles of 425g. 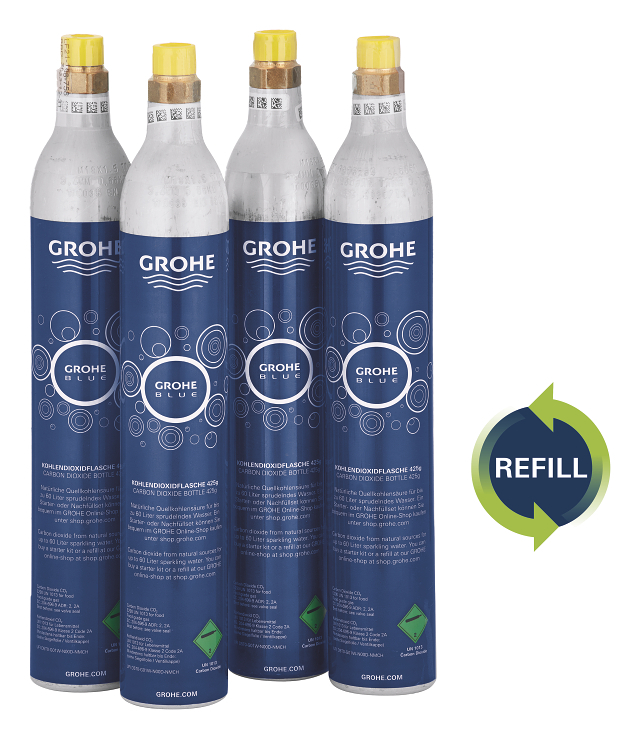 Please note that if you are purchasing the GROHE Blue Refill 425 g CO2 Bottle (40687000) you must already have 4 empty CO2 Bottles in order to have them refilled and should read our 5 simple steps to get your CO2 bottles refilled. If you do not have 4 empty bottles, we recommend you purchase the GROHE Blue Starter Kit 425 g CO2 Bottle (40422000) which consists of 4 full CO2 bottles – once these bottles have been used and are empty, you can in future choose to have them refilled by selecting GROHE Blue Refill 425 g CO2 Bottle (40687000) – saving you money and the environment! 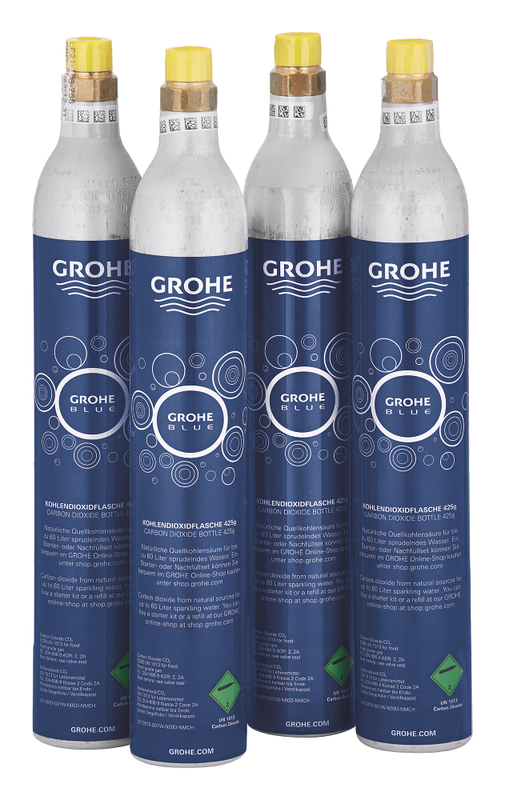 Please note: if you do not have 4 empty bottles yet, you first need to purchase the GROHE Blue Starter Kit 425 g CO2 Bottle (40422000) which consists of 4 full CO2 bottles – once these bottles have been used and are empty, you can in future choose to have them refilled by selecting GROHE Blue Refill 425 g CO2 Bottle (40687000) – saving you money and the environment! Please see below our 5 simple steps to get your CO2 bottles refilled. - H280 Contains gas under pressure; may explode if heated. - P102 Keep out of reach of children. - P410+P403 Protect from sunlight. Store in a well-ventilated place. Have you just ordered your GROHE Blue Starter kit? Then now is the perfect time to purchase the CO2 starter kit. The five CO2 bottles will guarantee an end to annoying shortages. Your starter kit includes one 425 g CO2 bottle. Order one CO2 starter kit (40 422 000) which includes four CO2 bottles, in order to have five full CO2 bottles. As soon you have four empty 425 g CO2 bottles, you can order a refill (40 687 000), so that we can refill your bottles as you are using the fifth one. The GROHE CO2 refill process ensures that you always have a full CO2 bottle, and you will never miss refreshing CO2 from natural sources in your filtered tap water.